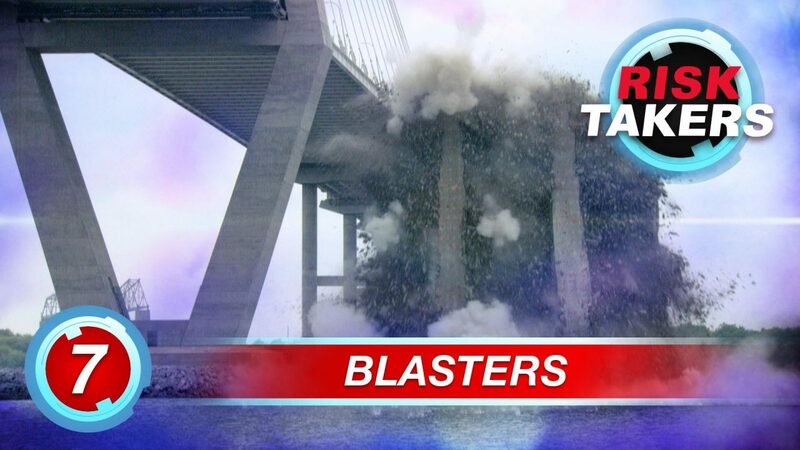 Blasters deal with thousands and thousands of pounds of explosives. For instance, Marlyn King, an experienced blaster in the coal fields of Wyoming, can use up to 700,0000 lbs of explosives at one time – that’s 140 times more explosives than the 1995 Oklahoma City bombing. It’s a risky business and veteran unbuilder Mickey Rogers knows “you’ve only got one shot to get it all right”! But figuring out how much explosives to use is a challenge in itself. Using too much explosives for a blast can cause rock to fly uncontrollably – injuring people or damaging property.Using too little not only leaves a job unfinished, it also forces a blaster to investigate, searching in a rock pile in which there is live ammunition that could blow-up at any second! Mickey is currently demolishing the Old Cooper River Bridge in Charleston, South Carolina. Existing only 40 feet away from a brand new, multi-million dollar bridge – Mickey has no room for error! No more than Frank Lucca, who is blasting on a daily base right in the heart of Manhattan. It’s Risk Takers at it’s best, our heros put their lives on the line knowing that any mistake could be their last.